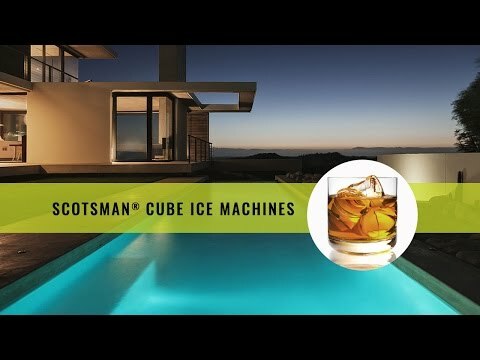 This Scotsman Outdoor Ice Machine features a slim 15-inch cabinet width and produces up to 65 lbs of gourmet ice in 24 hours. Easily store up to 26 lbs of ice, while using less than half the energy and one-third the water of previous models. The gourmet, crystal-clear ice is slow-melting and taste-free so it will not dilute the flavor of your drinks. This model comes equipped with a user-friendly control panel that informs you whether power is on, alerts you if there is a no-water condition, and features a time to clean reminder. Water-quality sensor detects hard water conditions and control system purges mineral laden water with every harvest cycle, which helps extend the time between cleanings. The self-closing stainless steel door is field reversible so you can custom fit this unit to your design needs. This ice maker uses an included drain pump system for ice melt water removal. The stainless steel cabinet provides a sleek, stylish look that goes well with any decor. Scotsman offers a one (1) year parts and labor warranty on this ice maker. The compressor is warranted for five (5) years.